Welcome!! Happy World Cardmaking Day! I hope you're enjoying the fabulous hop hosted by Operation Write Home! Bringing a little bit of Joy! ﻿I make cards for our Troops because its a small way I can give back to those who serve our country... Operation Write Home cards will carry a message between two distant hearts this holiday season - and they will be there the rest of the year too with cards for all occasions! I hope you'll support OWH, if not in making cards (Christmas Deadline is October 31st!) then please donate and help send these cards out on their mission, and spread the word about this great organization! Thank you for hopping today, Enjoy! I love how you used the flag! The pearls are a great added touch! 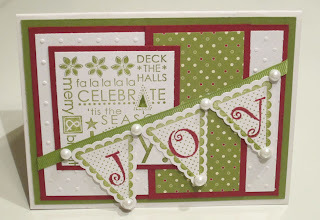 Angie, your banner card is so festive--just chock full of cheer! Love it. . . . I just love the banner with the pearl accents - sooooooooooo pretty! I love the background square with all the christmas words - would love to know where you got that! I like your geometric juxtaposition! Cheerful colors and layers--will make a great decoration! I love the way you used ribbon to hold the banner. I saved your card to my inspiration folder for later. Thanks! Wow. Love the colors used and the banner! That LO is pretty cool! TFS!!! Love the JOY banner, and the colors are awesome! I love these colors and dimensions. Awesome. Fantastic card (I love the colors) and the banner really sets it off. Love the colors and the banner! Hi Angie! I love your combo of crisp green and white w/ a touch of cranberry red! Love how the dots and embossing complement each other. Great job! Love the red-it makes the interesting shapes really pop. I love your card!! The banner across the front is fABULOUS! So glad you are in the bloghop!! Great Christmas card... thank you for supporting OWH. Nice muted colors. Love the textures and the pearls, too! I love that white paper with the raised dots. I need to find that! Great card. Cute as can be! Love the layout and colors and the banner is so fun across the front! I love the colors and geometric squares and triangles. Thanks for sharing. Beautiful card. I like all the shapes, and the colors set against white. Pat K.
Love how you JOY banner is positioned! Pretty card! I love that banner! The colors are GREAT! Great festive card. I like how the little bits of red make the layers just pop! Love the banner! Thanks for supporting OWH! Love the card. Where did you get the papers from? Terrific card! I like how you were able to take the flag banner and use it on a Christmas card. It's something I would think of as summery but you've helped me "think outside the box". Thanks for joining in the hop and supporting Operation Write Home. Loved the way you popped the patterned paper on the red and then used the red ink for the JOY letters! Really makes it come together. Striking card and thank you for the October 31 deadline - I need to get busy! Borders around each element make them each stand out. Great card! Precious pearled pennant! Say that three times fast. This is so pretty! The layers are perfect! Fabulous card! Love this use of that fabulous stamp! The pennants are the perfect touch! This blog hop is turning out to be very bad for my pocketbook... Pennant punches... Something else that I simply must have. :) thank you for sharing this super cute card! i love your banner card, so sweet! Beautiful card! Love the banner. I really like that sentiment block! Reminds me of subway art... the color combo is perfect on this card! Thanks for showing another great use of the pennants! Your color choices are yummy! Making a sketch of this one!! Nice! I remember the set and had such a hard time using it, you did a wonderful job, I love it! like everyone else said, these colors work perfect! as do the layers, the stamps, and the pearls! but for some reason, my eyes ALWAYS go to the polka dot embossing!!! that just brings the whole card together for me!! Love your festive card- great banner- love it! Thanks for all you do- great OWH blog hop! I am realllly starting to love banners...wasn't sold on them at first, but you rocked this card, Angela! I think I could be a believer. Beautiful card - I love all the layers and the banner! Thanks for sharing with OWH! Love the layout, especially the banner. Wow! Very different layout! I can't wait to try it! Thanks! I really like this card, especially the pearls on the corners of the flags. I think that final touch just makes the card! Thank you for showing us! Your card is very eye catching and I love the pennants. For some reason I don't think to use pennants on a card but your card is truly inspiring! Your layout is great, using the banner across the front really draws the eye.